Reachers > Reacher Grabbers Reviews and Deals Buy 2 -- Just in case! Let me help you find the best reacher grabber for you or your loved one. I have personally benefitted from using a reacher grabber tool and decided to share what I know about the reachers I have used. I hope you find this information helpful. A reacher grabber tool is extra handy for people with disabilities, back or leg disorders, or others with dificulty reaching or grabbing things from high and low places. There are many types of reacher grabbers, such as aluminum reachers, the ez reacher grabbers, ergonomic reacher grabber tools, folding reacher grabbers, and many others including a replacement for the discontinued golden retriever reacher. 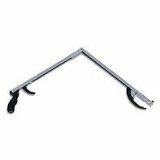 The reacher tools I use the most are the Medline Reacher (formerly the Golden Retriever Reacher) and my recommendation for the best cheap reacher grabber (see below). Finally, read about how my reacher tool came in handy on my trip around the country. Have specific questions? Send an email to dan@reachergrabber.com and I'll try to help you ASAP. 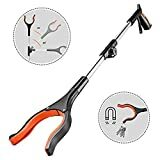 No assembly required, Easily picks up anything from a penny to a can of vegatables, Professional quality, Easy grip handle, 31 inch ultra light reacher tool. This reacher is a replacement for the golden retriever reacher which is no longer made. This folding reacher is a folding version of another great reacher that is extremely lightweight and durable. There is a magnetic tip with a post that also helps you pick things up or drag things. The claw is great for picking things up off the floor. The only drawback is it's not the best for grabbing jars or containers, however, it is wonderful for about 95% of things. Find this folding reacher at it's best price using the button below. Or browse additional folding reachers. This is a super affordable reacher grabber tool that is a great backup reacher if you have a favorite, but will also do the trick if you just need an old reliable. Usually around $10, you could buy two of these and they'll go a long way. The magnetic tip works well and the trigger is easy to use. 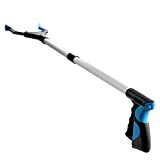 Find this cheap reacher at it's best price using the button below. Or browse additional cheap reacher tools. Here are some additional reacher grabber tool reviews that we have put together for you. These are based on hands-on experiences with these reachers. QUALITY ASSURANCE: 18 month free return shipping warranty, if your have any question, pls contact us., FOLDABLE DESIGN: Adopt folding type design, shorten length, facilitate outdoor carry, also can collect in the cabinet, make the home puts more neat and beautiful., PREMIUM MATERIAL: Use lightweight aluminum alloy material, reduced labor intensity, wth arthritis and carpel tunnel syndrome and need products like this which are easy to use., EXTRA STRENGTH GRIPPER: Textured rubberized ends easy to grab 3-5 pounds of objects that don't fall off, it can be used to hold a red wine glass without leaving a clip., EASY GRABBING: Reacher grabber to pick up items with easy, picks up coins, envelops, trash etc, easily pull the trigger, it starts work, reduces labor intensity, makes our work become easier. Unger Professional Nifty Nabber, 36? LIFETIME GUARANTEE: Your reacher grabber is backed by an unconditional lifetime guarantee. Order now with confidence., CONTOURED HANDLE AND TRIGGER: Padded, anti-slip handle and contoured trigger matches the natural shape of your hand for comfortable, pain-free use. Especially important if using for extended periods of time., ROTATING & RUBBERIZED JAW: Jaw can rotate a full 360 degrees in 90 increments to be used both vertically and horizontally for hard to reach places like behind furniture and appliances. Coated with anti-slip material allowing you to lift slippery items like glass or smooth plastic bottles., BUILT TO LAST: Updated 2019 internal mechanism is built from sautered steel wiring to last for tens of thousands of pick ups. Can pick up items as large as 5 lbs. 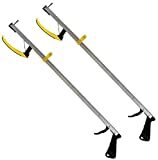 Rust-proof frame will hold up to heavy duty outdoor use., 32" PATENTED DESIGN FOR ADDED REACH: Pick-up items from the top shelf, floor, lawn or behind furniture. Save your back and avoid a stepping stool. Also great for picking up trash or other items you don't want to touch. MADE FOR EVERYDAY USE and MADE TO LAST! Don't waste your time and money on a Reacher Grabber that doesn't work and falls apart quickly! This Natural Relief Solutions Reach Extender Aid is made from heavy duty, yet light weight materials, and is made to be useful and durable for all of your needs! Don't wait any longer! 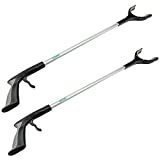 Click "Add to Cart" now so you can experience the joy and ease of use of your Natural Relief Solutions Reacher Grabber right away!, PERFECT FOR THE ELDERLY, SENIORS, HANDICAPPED, DISABLED and THOSE WITH LIMITED MOBILITY- Your Reacher Grabber Tool is designed with two things in mind, premium quality AND ease of use. 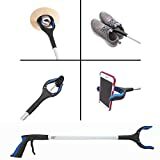 Use the ergonomically designed handle and lightweight gripper to easily grab any item, even slippery and smooth items like metal and glass, and small items like coins, pills, and keys., EXTEND YOUR REACH INSTANTLY! Not only will you be able to add 32 inches to the reach of your arm, you'll also have have super strong and secure rubber grippers to act as another set of nimble but powerful fingers to reach and pick up almost any item... all without bending, stretching, or twisting!, 100% MONEY BACK GUARANTEE - In the very unlikely event that you do not absolutely LOVE your Natural Relief Solutions Lightweight Mobility Hand Grip Reaching Picker Aid , for any reason whatsoever, we'll refund you the full price NO QUESTIONS ASKED. That's how confident we are that you'll be happy with this purchase., NEW RELEASE VERY LIMITED SALE PRICE! DON'T BE FOOLED BY CHEAP IMITATIONS - There are a LOT of cheap knockoff Grabber Reacher Tools for the Elderly on Amazon but this is NOT one of them! Don't be disappointed because you tried to save a few bucks and got a cheap Grabber Tool that doesn't work. If you're going to invest in a Reacher Grabber Pick Up Aid, then why not GET A REAL ONE THAT ACTUALLY WORKS! Thank you for visiting my reacher grabber review site.